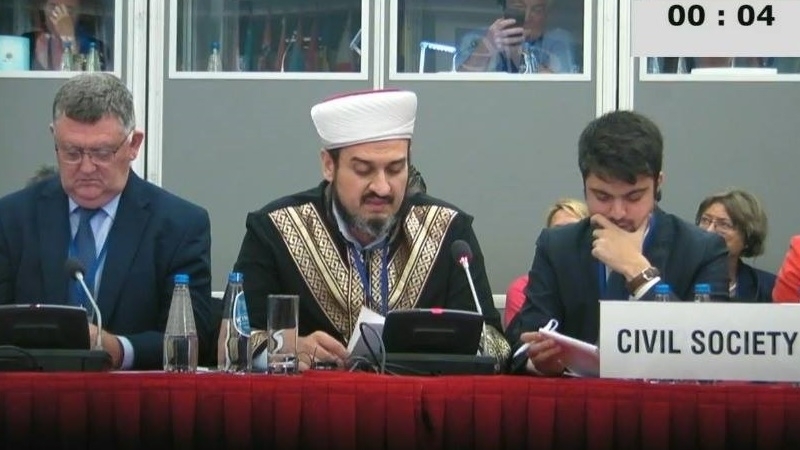 The Russian authorities are aiming to intimidate the active pro-Ukrainian population of the Crimea, to force people to remain silent or leave the peninsula, said the Mufti of the Spiritual Administration of the Muslims of Crimea, Aider Rustemov, at the OSCE Conference on Human Dimensions. Rustemov published the text of his speech on his Facebook page. According to him, since March 2014, that is, from the first days of occupation, Russia systematically conducts repression against certain groups of the population in the Crimea. Mufti noted that repressions can be easily called politically motivated, as they affect pro-Ukranian citizens, in the majority of cases, the Crimean Tatars, most of them are Muslims observing the religion. Aider Rustemov noted that the occupiers in Crimea are judging people for the Internet publications made before March 2014, for possession of books and participation in organizations that were not banned in Ukraine either before annexation, or now. Rustemov drew the attention of the conference participants to the role of the so-called Crimean Muftiyat in repressions, as it lays information on Muslims. The Mufti of Crimea demanded to stop the harassment and persecution on religious grounds. He called for the release of 32 arrested Crimean Tatars and 40 other political prisoners of the Crimean occupation regime. Earlier, First Deputy Minister of Information Policy Emine Dzhaparova at a conference in Warsaw said that the RF spends millions to create a parallel reality distorting the real situation in Crimea and the Donbas. According to her, the Russian authorities persecute independent journalists and bloggers in the occupied territories and use controlled media for propaganda and misinformation. In turn, Foreign Minister of Ukraine Pavlo Klimkin noted that Moscow is using fake news, speeches by so-called "journalists" of propaganda channels and members of fake "organizations" in order to turn the OSCE human rights conference into a farce.